An abundance of creatures such as grass snakes, slowworms and elephant hawk moth caterpillars are testimony to the benefits of unkempt gardens. But they would never win a Britain in Bloom award - and many would be ordered to be destroyed by local councils using their s.215 powers! Please allow several minutes for the photos to load. Most are high resolution. Photos may be copied provided the source is acknowledged. or a valuable low cost habitat for wildlife? See the photos below to find out. Would you be surprised to learn that over a period of two years a District Council spent probably thousands of pounds of public money pursuing and threatening a man whose only 'crime' was to grow long grass and a few nettles for the benefit of wildlife? Is it sensible that as a nation we spend �500 million every year on gardening (most of which is environmentally neutral or damaging) yet we give less than �0 million to all our wildlife conservation groups put together? to highlight the 'bully boy' tactics adopted by some zealous local councils, and the limited legal redress that is available against them. It is important to recognise that gardens provide one of the last refuges for much of our wildlife. In the farmed countryside only a narrow monoculture now exists. These areas are essentially devoid of wildlife. Many summaries are available showing how much wildlife we have lost since in the last century. Gardens that abut the open countryside can be especially important for wildlife, as can those that provide a corridor for wildlife to travel between one area and another. Wildlife gardens can either be deliberately designed (which takes time money and effort) or a conventional garden can be left to 'go back to nature'. In the UK, expenditure on gardening runs at around �500 million annually, or about �0 per household. However, as many households do not have gardens, the true average expenditure per garden is closer to �0 annually. In contrast, less than �0 million is donated in the UK annually to all of our 'wildlife conservation' charities, two of the largest of which are the World-wide Fund for Nature (WWF-UK) (which spends around � million a year and has 320,000 members) and the Royal Society for the Protection of Birds (RSPB) (around � million a year and just over one million members). Averaged out, �0 million is around �per household or �per person - a wholly inadequate sum for such a rich country, yet even these figures are higher than in other European countries. In essence therefore, we spend a large amount altering the environment in our gardens (and much of the money is used essentially for environmental destruction) yet give a much smaller amount to helping to save far more valuable natural environments and their wildlife. Given that the UK has the fourth largest economy in the world, we set an appalling example. Also, we expect poorer nations to 'conserve' the world's wildlife whilst doing little to help them. sell the lawnmower and strimmer and donate the proceeds to charity. You will not be needing them. If you want to keep a small area neat and tidy, borrow a neighbour's equipment. get rid of all your poisons, pesticides, ant killers, fungal washes and the like. Rather than throw them away you might as well give them to an unconverted neighbour. At least he might not go out and buy yet more of the stuff. try to create as many different habitats as possible. A pond is useful (without fish), and will in time grow a wide range of plants. You don't have to import frogs, newts and the like. They should eventually arrive by themselves. A sheet of old corrugated iron laid on grass will be appreciated by voles, mice and slowworms (Anguis fragilis). Thick hedging is much preferred to brick walls. Plants should be mainly what people call weeds (which are plants well suited to their local environment) and again will not need to be imported. If you are starting from the barren wasteland of a typical Britain in Bloom garden then you need to remove all the prissy flowers, keep what shrubs you like and generally let the ground go back to nature for a year at least. Within a couple of years it should start to look like the famous Sidford garden. You can of course pull up plants that are taking over too much such as bindweed and docks and maybe some of the patches of nettles. But in time things will settle down. All the time you used to waste mowing, weeding and generally preventing nature from doing what she wants to do, can be spent more productively. 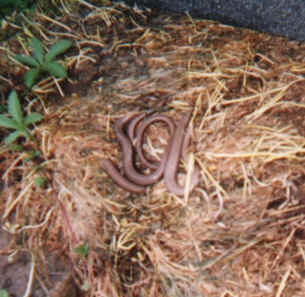 Slow worms (usually slowworms) are beneficial to gardeners. They feed on a range of spiders, beetles and slugs. They can often be found basking in the sun on rocks or paving slabs in 'untidy' gardens and (according to a US website that disappeared recently) have been known to live for 54 years in captivity. They look like small snakes but in fact are legless lizards. In winter they hibernate, usually underground. A better photo is on the uksafari website. A group of slowworms beneath an old piece of roofing felt thrown onto long grass and left for a few months. The area was first colonised by voles who reared their young. The slowworms later bred successfully. Untidy gardens can provide more valuable habitats than neat and manicured lawns and borders. Of course, you can create useful habitats that are also neat and tidy - but at least think before you garden. A university thesis is available on the spatial ecology and ranging behaviour of slowworms. A recently confirmed addition to the Sidford Wild Garden is a family of grass snakes. 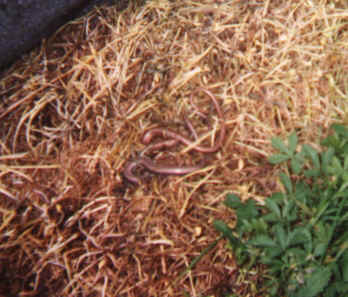 In June 2005, two young snakes were found, basking in the warmth under a piece of roofing felt with about 30 slowworms of various sizes - ranging from 50 to 300 mm. One of the baby grass snakes is shown above. Always handle small snakes and slowworms gently. More photos and text will be added here, showing examples of both managed and unstructured wildlife gardens, and pristine (yet sterile) Britain in Bloom gardens. If you want to create a miniature wildflower (meadow) garden you will find it hard work. The first requirement will probably be a lower fertility in the soil. Cropping long grass for hay for a few years may be useful. There are several good books on the subject. One of the best is by Professor Chris Bains - try your local library or the Internet. Many websites encourage gardeners to think about how they could encourage wildlife. It is essential that the importance of creating suitable habitats is more widely recognised. This is a particular concern in the context of local councils being encouraged by central government to issue s.215 clearance notices against 'overgrown gardens'. Elephant Hawk Moth (Deilephila elpenor) caterpillars in Sidbury village. 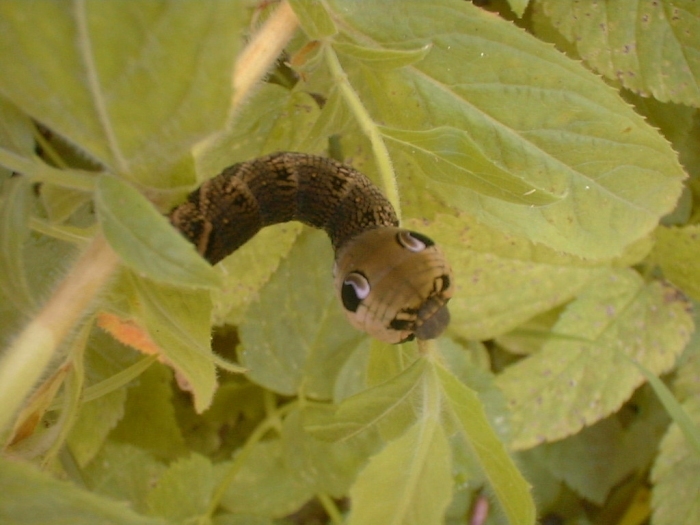 In August 2005 the SeeRed author was alerted to some large caterpillars feeding on willowherb in a wild garden in the neighbouring village of Sidbury. Coincidentally, emails received in the same month alleged that a district council elsewhere in the UK was invoking s215 of the Town and Country Planning Act to try to force a man to cut all vegetation in his 'untidy' garden down to a height not exceeding one metre - this having been decided by some ignorant planning officer to be 'appropriate to the neighbourhood'. 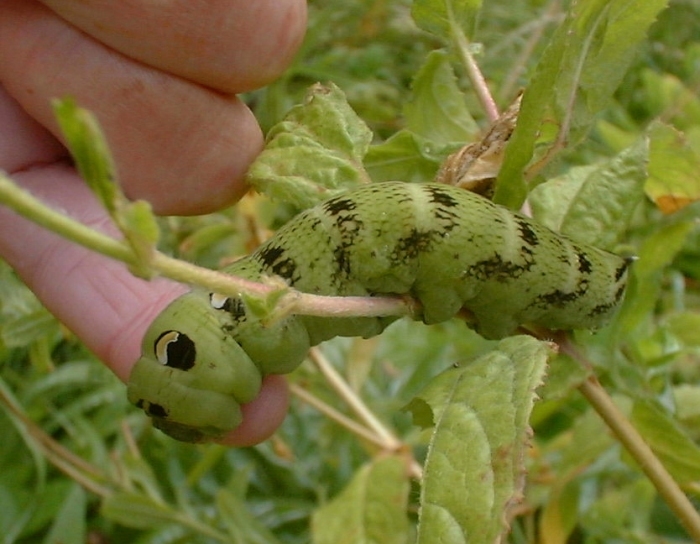 If carried out, this might have destroyed some of the food plants of these caterpillars! If morons in town and district councils are allowed to abuse their official positions to this extent, all councils need to be stripped of their powers to dictate to residents: deciding which plants to grow in one's own garden should be a matter of personal preference, except perhaps in cases where conifer hedges grow to exclude all light. This has been the subject of separate legislation. In a small area planted with willowherb there were four caterpillars, one green and three brown. 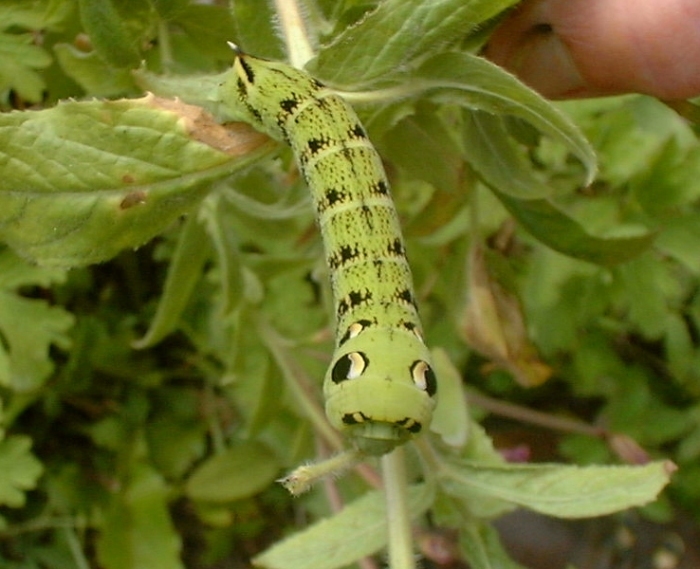 Willowherb is the preferred food for this species, but they will also eat fuchsias. 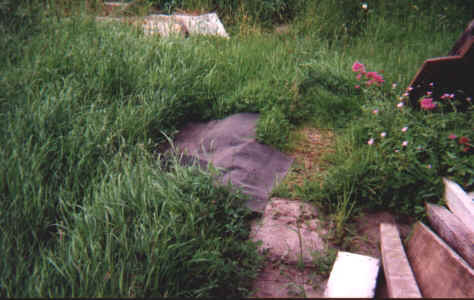 The 'untidy' flowerbed containing the willowherb and caterpillars. Most of the plants growing here are classed as weeds - but all are valuable for wildlife. 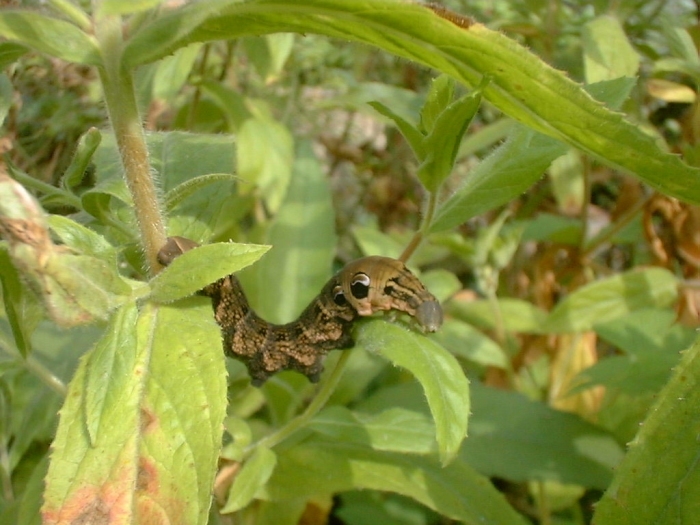 The dense ground cover is important in helping to protect the caterpillars when they fall from the plants to begin the next stage of their development into a moth. Lurking on the willowherb - and already showing the two sets of false eyes that are such a distinctive feature of the fully developed caterpillars. This was about 50 mm long. Note the horn-like dorsal spine at the rear end. A few days later and viewed 'end-on', the transformation begins. Black markings appear all along the body. The retracted 'trunk' is clearly visible. The overall length was now almost 75 mm. These caterpillars can attain 90 mm. Another view of the black markings that develop in the course of 48 hours. Again, the mouth parts are shown retracted. The four false eyes are already well developed to deter potential predators. When alarmed, the head and thorax can be withdrawn into the abdomen causing the eyespots to appear even larger. The fully developed caterpillar is a voracious feeder, shown here with its mouth parts or 'trunk' extended. Much of the willowherb was stripped of its leaves within a week. Looking like a monster in a bad dream, another view of the same caterpillar with its eyespot region enlarged. There are several types of willowherb - these leaves are probably those of the Great Willowherb. 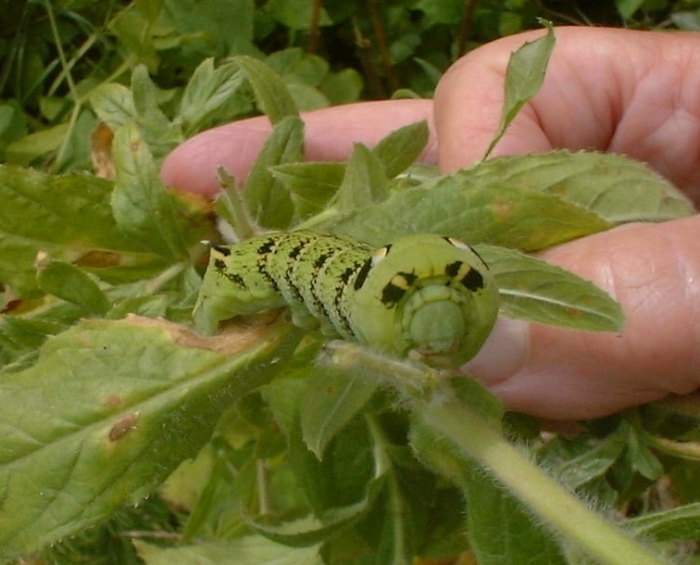 There are many striking photographs of Elephant Hawk Moths on the Internet - just ask Google! A few days later, the green caterpillar is still green. Torrential rain forced a retreat from the willow herb, but next day both green and brown caterpillars were back, munching their way through the remaining leaves. 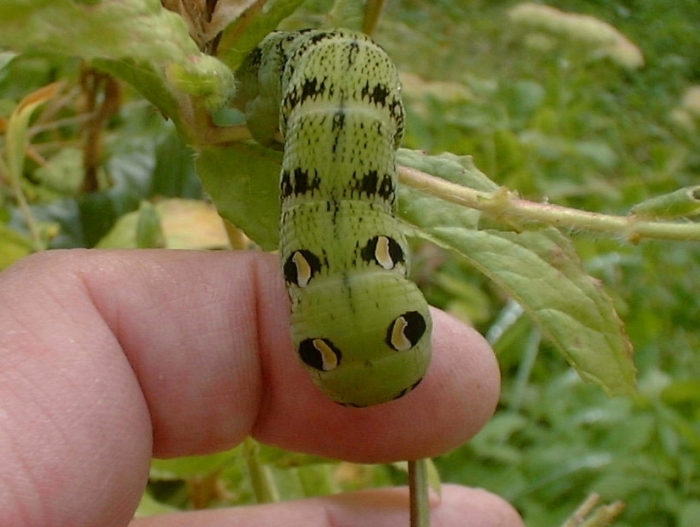 These last two photos were taken on 26 August 2005, exactly a week after the green caterpillar started to develop its black markings. Clinging on for dear life? !